Bumper Just Word Search has been the ideal word search magazine to provide an ideal food for churning the brain in the lazy afternoons. Buy a single copy or subscription to Bumper Just Word Search magazine. This is a monthly magazine, conceptualized and published in the UK. Some of the brilliant brains are responsible for this magazine being so awesome with regard to its level of puzzles. The quality of the puzzles has made this magazine a perennial favorite of the puzzle enthusiasts. This is a full color word puzzle magazine which offers something great for everyone and in turns promises hours filled with playfulness and joy for all the ages with its vast array of intriguing, fascinating and informative puzzles about words from everywhere. The magazine offers just the right element of fun which every reader desires of. 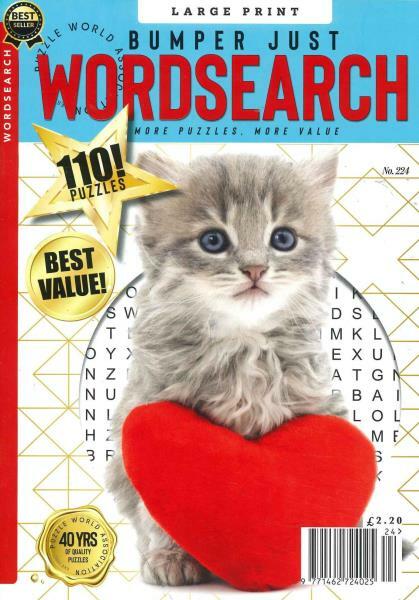 The readers get a wonderful time with the irresistible and captivating word find puzzles. This is just perfect to sharpen one's skills in deductive reasoning. Many people face troubles when it comes to reasoning and other logic based exercises; the magazine can provide a fun filled answer to such a problem and has the power of even converting them into logic lovers. The puzzles are definitely a source to raise one's intellect and thus elevate the spirits.